I've literally had dreams of flying too many times to count. Literally. Like I'm able to fly and in a state of elation. In these dreams, I start walking and then suddenly I'm able to fly and pass over different sceneries and also from one building to another. And when I wake up, I am disappointed that it was just a dream. I have always had a fascination for birds and sort of envious of their freedom. Just looking at them makes me feel so happy and being surrounded by these beautiful creations of God brings me such extreme joy! 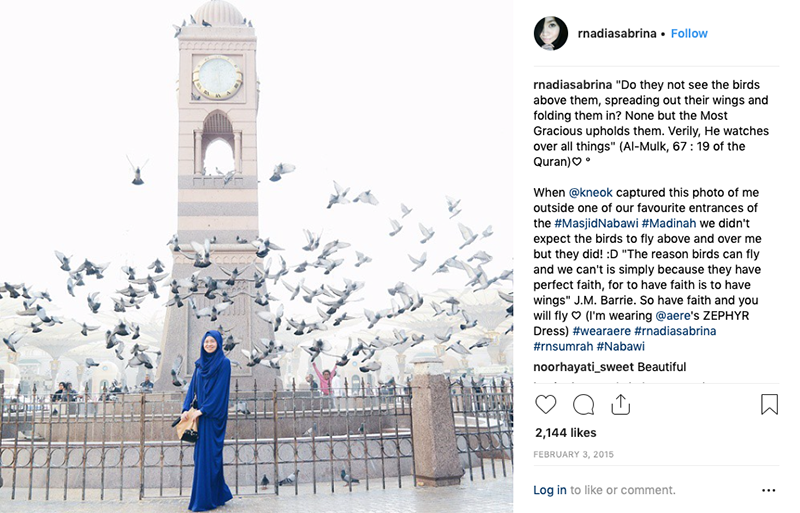 4 years ago when I went for umrah, as I was taking photos at the clock tower in front of the main entrance of the Nabawi Mosque in Madinah, suddenly a girl ran towards the birds causing a huge flock of birds to fly around me. Its one of my favourite personal photos of all-time. Whenever I look back at this photo I shared on 3rd February 2015, I've always felt so very happy. Thanks little kid! The serenity, the peace, the beauty, the aura. Miss. So. Much. 💙 May our love towards our beloved Prophet Muhammad be increased by the One who created LOVE. May our knowledge about him be increased too. Missing Madinah and umrah. Sharing my own post in Madinah, the holy city of the Prophet Muhammad from January 2015. 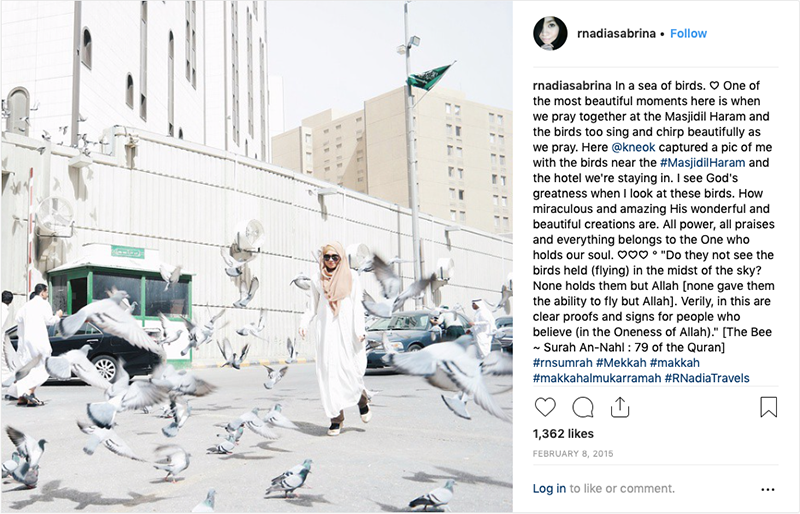 Below is another shot of me with some birds flying all around in 2015 and this was shot at the exact same place one of the shots in my post REBORN was captured in Mekkah near Masjidil Haram recently in February. I also linked the post to another post where there's another similar shot of me at the same place in 2012.This reminded me of how beautiful the ambience and aura around Masjidil Haram when I went there recently where birds are flying around the Kaaba throughout the day and night, all the time. During our umrah this time around, this happened after we did our prayers in the Quba' Mosque in Madinah and when I was about to take a photo! The first photo of this post. I was ecstatic! It was a burst of joy and happiness! The moment was just a few seconds but it was really just so amazing. I am glad to have been able to catch it on video which I've just shared on IG the same time I'm posting this here on the blog. (So head on to my IG and check out #rnsUMRAH if you want to see the video) or click HERE to watch on IG. Other than being in Mekkah and Madinah, the other thing that made me felt really humbled, grateful and super duper happy at the moment was the fact that I get to use the crutches more instead of being dependant on the wheelchair all the time. I became more mobile and was able to walk with crutches. Alhamdulillah. The blog's 10th year Anniversary is happening this month and I started re-reading some of my older posts when I was posting REBORN. It feels very nostalgic to look at the older posts and reading a glimpse of who I was all those years ago. I am so glad I shared the photos, writings and my thoughts here for me to look back on. One thing that I found was that recurring themes of the things that I want to post now can also be linked to the posts that I have written in the past. After 10 years of writing on here, I wanted to challenge myself to blog more this month and at the same time try to relate each post that I write with an older post throughout the past 10 years. Here in this post I'm wearing a blush pink and grey look that was caused by circumstances and not intentionally, which reminds me of my look in my Knot me Not, Don't Leave it to Naught 2011 post that I posted on 3rd February 2011, 8 years ago. Does anyone remember this look? *krik krik* I do remember because blush pink and grey is definitely one of my favourite combinations, it was the combination of one of my wedding dresses as well. One of the photos in this post were my profile picture for a long time for FB, Twitter and then IG I think. Don't get me wrong though, I am not complaining about the weather. Alhamdulillah that I get to experience my first umrah in the unexpected cold weather throughout my trip this time around with my parents and husband. My first umrah trip was in June, where the weather reached 40-50 degrees. My second umrah trip in 2015 was in January and February but the weather was not as cold as this one. I am told that winter is much, much colder but 7 degrees is cold enough! Luckily, I didn't have to look far because I stumbled upon a nice grey jacket at a shop right under the Hotel I was staying, and I liked it so much cause it matched most of my looks there. I didn't have to buy any other jacket because this one was just so nice. My mother got the same piece in a different colour. In that post Knot me Not, I wore my mom's old top and I remember I did that a lot with my looks. Mixing and matching my mom's vintage items with my own. I did it recently on another trip and I will share it soon insyaAllah. In Knot me Not I wrote about my pain and how I bought FitFlops for the first time ever to help me with my pain. This reminds me of the current gold FItFlops that I've been wearing daily nowadays. It was December 2017, I was in Dubai for the first time. I remember when I had to leave Elhan was still in the hospital, I was with him every single day that he was admitted until the day that I had to leave. When I was at the airport, my body was in so much pain. I realised it but I thought I was just exhausted. So, I ignored the pain. The next day, we had to go to find an alteration shop for 2 of the looks to fix a few things for our fashion show in Dubai, and at that moment I was in so much pain all over including my legs and it was so difficult for me to walk, I initially thought it was the shoes. So I saw a FitFlop shop and bought a gold fit flop because I know its good for my back and legs. After wearing it, my feet felt better but not the rest of my body. The pain was excruciating. I had to do a thing that I would never imagined before for my first time in Dubai. I had to rest my body at a cafe while waiting for the alteration to be done. So while the rest went back to the alteration place I had to rest my body at the cafe. When it was time to leave, I wanted to take the cab back to the hotel really but we walked back. I just tried my best to fight the pain. The pain didn't go away but I ignored it and continued the show, continue to capture moments over there... and when I came back from the trip I then again prepared and went to travel for aere's first fashion show in London, and then aere's second show in Dubai and then I went to my first ever humanitarian mission in India. No one actually know I was going through a lot of physical pain throughout all the travels that also affected my overall wellbeing. Of course, I only shared moments when I seem okay, not in pain and able to smile. Just before Eid last year, I know I had to step back and focus on my health which I have ignored to basically focus on my work and family. Whatever I have planned for, goes to the drain. Being sick is not something anyone would wish for. Your health being taken from you, especially the kids that make you not able to go on with your daily life is not something you would wish on any body. Saying I have learnt a lot from all that has happened till today is an understatement. Looking back at the Knot me Not post, I realised that I did already mention that I was going through physical pain. That was 8 years ago. Maybe it is not as bad as now (though enough to keep me hospitalised for about a month and undergo different kind of treatments at the time) but I have gone through it before. The only difference is now it is more severe and now it is a different type of disease, and now I've finally found out that I have chronic illnesses and autoimmune disease, it explains why I have been going though a lot of different kind of symptoms and most importantly it also reminds me of how I manage to get up after a fall, and try to walk again after each and every fall. "I guess the moral of today's lesson is that life sometimes have different plans for you. Last minute emergencies may scupper your plans even though you plan early but let not the knot of life leave you to naught and tie you down. " Okay, so packing for a warm trip and finding the weather to be colder than expected might not be a huge emergency (neither is having plans cancelled for that matter), but still, don't be tied down by the knot of life, knots that sometimes we create ourselves in our heads and our actions. That post also took me to my 2014 post, A Piece of Cloth on My Head : My Hijab Journey 5 where I shared the same grey and blush look and it was a part of a series I did about my journey starting to wear the hijab, read it and it is a good reminder from my past self to my current self as well. Salam Israk Mikraj! With that I end my post with one of my favourite short chapter from the Quran that have helped me gone through the worst throughout the years. I got it this translation and the notes from the MyDuaa app introduced by Yasmin Mogahed when I went to her talk last year and have been using this app daily because its so awesome! With the Name of Allah, the Most Gracious, the Most Merciful. Al-Ikhlas 112:1-4. - Al-Falaq 113:1-5. - An-Nas 114:1-6 - Whoever recites these three times in the morning and in the evening, they will suffice him (as a protection) against everything. The Hadith was reported by Abu Dawud 4/322, and At-Tirmithi 5/567. See Al-Albani's Sahih At-Tirmithi 3/182.